I published this illustration on Instagram yesterday, and it seemed like the message resonated with a lot of you. Thus, I decided to post that illustration here, along with a chapter from my interactive playbook, Break, Hearts. I used to think that love is synonymous with ‘sacrifice’. I could still remember the pride that was swelling inside of my broken heart from being able to say: “I’ve sacrificed so much for him!”–as if by sacrificing more, I had won a nonexistent competition to prove my significant contribution to the relationship; while the other party contributed much less. So, I sacrificed more to show how I can love more and to be loved more. I hurt my feelings to protect other people’s feelings. Only in the past few years have I realized that love is not about sacrificing something–or someone. It’s not about succumbing to anything–or anyone. We don’t have to choose who or what to be sacrificed to be able to love (and to be loved). Love should be a win-win instead of win-lose. A relationship is not a matter of mutual sacrifice. It’s about being able to compromise. And yes, it took me a long time to understand the difference between the two. When I love from a broken heart and hurt feelings, I came from the mindset of lack. Therefore, when I have to share the love inside of me, it has to feel like a sacrifice–because now that I’ve shared it, I ended up with less. 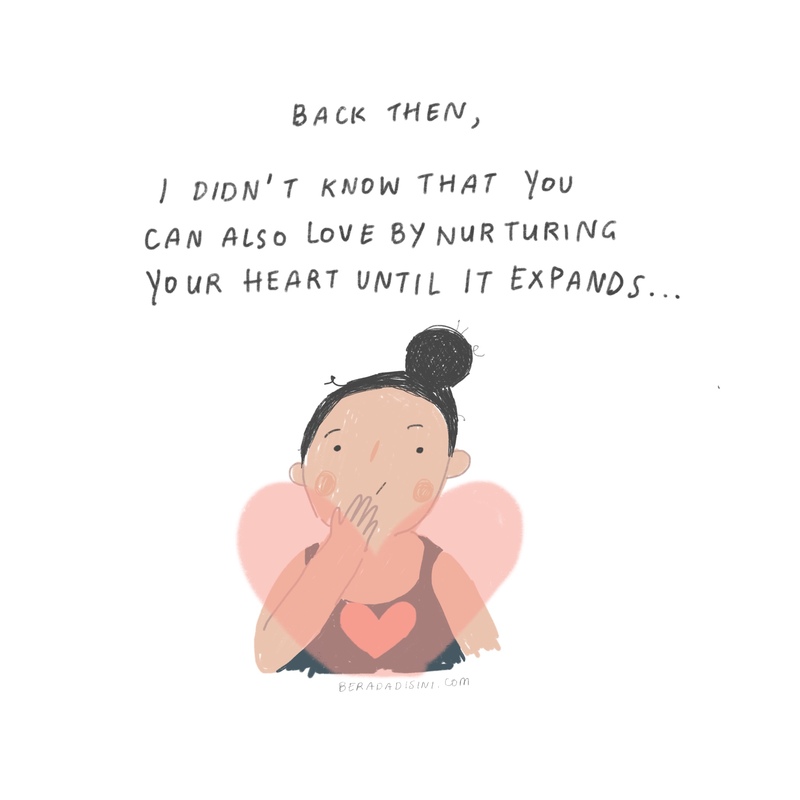 When I learned how to love from a heart that is full and content (because self-love has become my top priority), I realize that loving could leave me with a whole functioning heart–not only a fraction of it. It’s not a sacrifice. It’s a pleasure. There’s so much love inside of me to give; I can’t help but sharing it with the people I love. Excerpt from the interactive playbook, Break, Hearts. There are times when picking ourselves up after a heartbreak feels almost impossible. We feel as if we’ve lost ourselves. We feel as if the version of ourselves—the one when we were in a relationship—is missing. Strange. Because we cannot lose ourselves, can we? But, the truth is: we can. At certain stages in our lives, we can lose sight of our real selves. It is particularly for this reason that we have the term ‘self-discovery’—a journey to rediscover ourselves. But how do we lose sight of ourselves in the first place? Most of the times, by pretending to be someone else. We pretend to be someone we’re not to please others or to receive their approval. Some of us play this role for so long to the point where we start to believe that we are whom we pretend to be. Fake it until you make it, they said. This is precisely what some of us are doing. We are pretending to be the version of ourselves that—we believe—will be approved by others more, will be wanted by others more, will be loved by others more. For this reason, a lot of us enter a relationship by pretending to be someone we’re not. We are doing the things we don’t typically do, behaving the way we don’t usually behave, and tolerating stuff we often won’t tolerate. We are obsessed to find out what our significant other like or dislike, want or do not want. We believe that if only we knew all these, then we can present ourselves as an ideal partner. We are not confident that appearing as our true selves will interest our significant other enough. Thus, throughout the relationship, we keep molding and readjusting ourselves to please our significant other: craving for their approval. The problem started to kick in when we were tired of putting on a show and realized that we have turned into the person we are not. Which, to this extent, might be valid. On a day-to-day basis throughout our relationship, we might have presented ourselves as someone else. Someone we thought would better suit our significant other. We’ve been wearing masks. However, who is it that our significant other truly loves? Our masks or ourselves? If we appear in front of our significant other unmasked, do we think he or she would still recognize us—let alone love us? 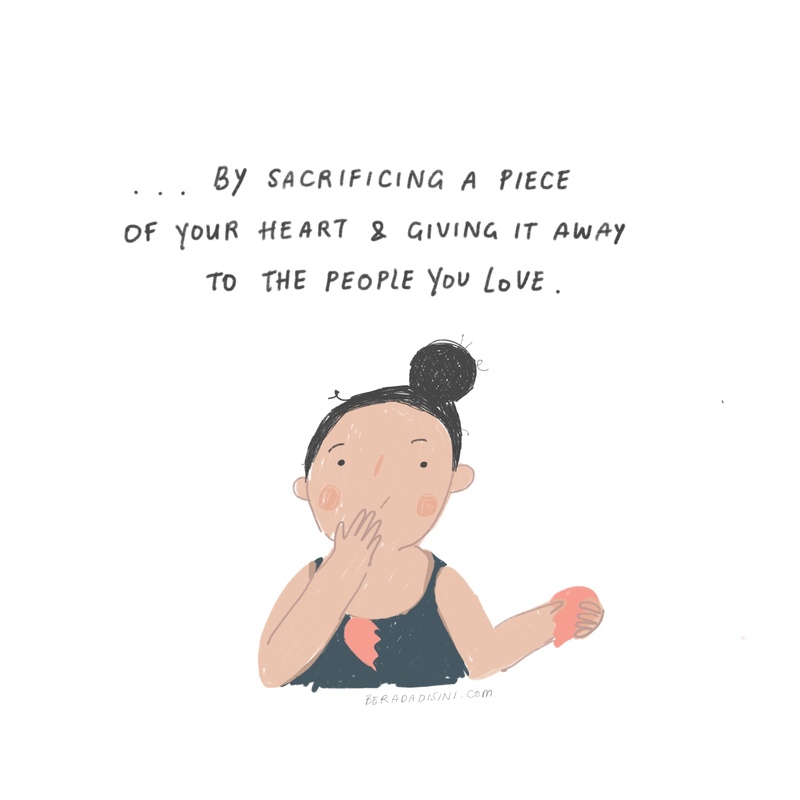 At the tipping point when we realize that we have repressed our true selves only to please our significant other, a word makes itself visible: sacrifice. But here’s a hard pill to swallow: love should not feel like a sacrifice. Sacrifice means one person gets nothing while the other person gets everything. If it feels unfair, we are right. It is unfair. The more we sacrifice, the more we got frustrated with our relationship, with our significant other, and ourselves. The more we sacrifice, the more we’re losing ourselves. The thing I’ve learned throughout the years is this: in a healthy relationship, we do not need to make sacrifices.